Robert Doisneau’s iconic photograph of young love in Paris sold thousands of posters, but the identity of the couple remained a mystery for decades. In 1988 Jean-Louis and Denise Lavergne saw it on a magazine cover and thought they recognized themselves: They’d been on the rue de Rivoli on April 1, 1950, and had a diary to prove it, and Lavergne still had the skirt and jacket she’d worn that day. They contacted Doisneau, who greeted them warmly but did not offer to share any of the five-figure income he’d been making each year from the poster. 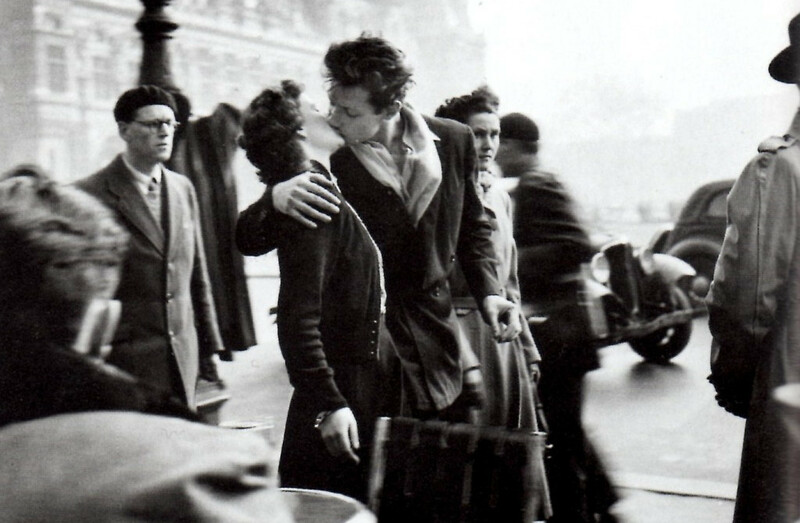 A thousand bubbles burst, the Lavergnes lost their suit, and Delbart eventually sold the print Doisneau had given her to feign a spontaneous kiss. She didn’t share the proceeds with Carteaud — they’d broken up nine months after the photo was taken.